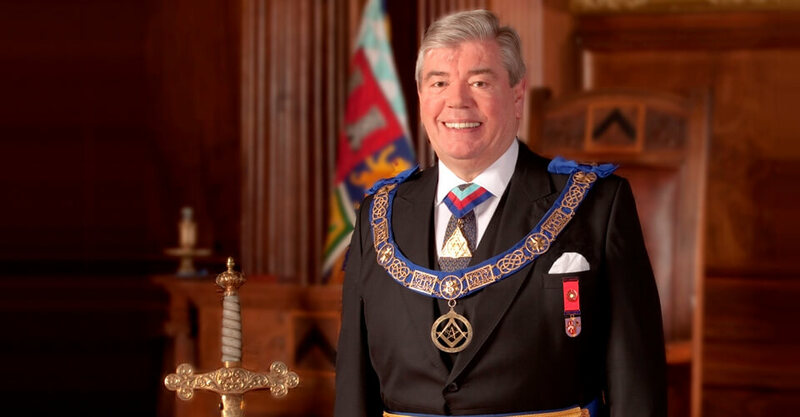 The Most Worshipful The Grand Master, His Royal Highness, The Duke of Kent, has been pleased to appoint WBro Sir David Trippier, RD, JP, DL to the office of Provincial Grand Master for and Grand Superintendent in and over East Lancashire. He was invested by the The Most Worshipful Pro Grand Master Peter Geoffrey Lowndes at King Georges Hall on Wednesday February 22nd 2012. Sir David Trippier was initiated in to Keystone Lodge in Rochdale by his father in 1968 when he was 21 years of age. He subsequently joined East Lancashire Centurion Lodge in 1971 and became Master of that Lodge in 1976. He was later promoted to be Past Provincial Junior Grand Warden and in 1991 became a Grand Officer in the acting rank of Assistant Grand Sword Bearer. He subsequently became a member of Royal Arch, joining Social Chapter in 1996 and became First Principal in 2003. He was later promoted to Provincial Rank as Past Provincial Deputy Grand Sword Bearer. Until April 2011 Sir David Trippier was the Chairman of Cambridge Horizons, the company delivering sustainable development in the Cambridge sub-region, and he was the Chairman of WH Ireland Group plc, Stockbrokers until May 2008 when the company was taken over by a consortium. He was until recently a Non-Executive Director of ITV Granada Television and has been a Director or Chairman of several quoted companies. Sir David was knighted by the Queen in July 1992 when he was 46 years of age. In 1994 he was appointed by the Council of the Stock Exchange to sit on the committee which formulated and launched the Alternative Investment Market (AIM) in June 1995. Since 1992, he has been Chairman or Main Board Director of three companies which have floated on the Stock Exchange and are now in the Main List, and one that has floated on the AIM Market. He was born in May 1946, and educated at Bury Grammar School and later was commissioned as an Officer in the Royal Marine Reserve in which he served for 30 years. He passed the Commando Course at the Commando Training Centre in Devon in 1969 and the following year qualified as a parachutist at RAF Abingdon. He subsequently qualified as a Company Commander at the School of Infantry at Warminster and later passed the Staff College Course at the Royal Naval College at Greenwich. He has served with 40 Commando Royal Marines in Singapore and Malaysia, 41 Commando in Malta and the 3rd Commando Brigade in Norway. He was awarded the Royal Marines Reserve Decoration in 1983. In January 1996, he was appointed Honorary Colonel of the Royal Marines Reserve in the North West by the Commandant General Royal Marines. He retired from that role in January 2010. At the age of 22 he was admitted to the Stock Exchange. He was also a director of a financial planning company as well as being a Stockbroker. He was a senior partner in Pilling Trippier & Co before it was taken over by Capel-Cure Myers whilst he was a Minister. He was elected to the Rochdale Metropolitan Borough Council in 1969. In 1975 he became the leader of the Council when he was 28 years of age and in the same year was appointed a magistrate. In 1979 he was elected as MP for Rossendale at the age of 32 and became MP for the new constituency of Rossendale and Darwen from 1983 to 1992. In 1982, Sir David was appointed Parliamentary Private Secretary to the then Minister for Health (Rt Hon Kenneth Clarke QC MP). From June 1983 to September 1985, Sir David was the Minister for Small Firms and Enterprise at the Department of Trade and Industry. From September 1985 to June 1987 he was the Minister for Tourism, Small Firms and Enterprise in the Department of Employment. In 1987 he became the Minister for Housing, Inner Cities and Construction in the Department of the Environment. Later in 1989, he was promoted to become the Minister of State for the Environment and Countryside. As the “Green” Minister he was instrumental in negotiating the international agreements on Climate Change and Global Warming on behalf of the United Kingdom. In February 1994 he became a Deputy Lieutenant of Lancashire. In 1999 he published his autobiography entitled “Lend Me Your Ears”. He was the National Chairman of the Tidy Britain Group from 1996 to 1998. He became the President of the Royal Lancashire Show for the year 1999. Sir David became Chairman of the North West of England Reserve Forces and Cadets Association from 2000 to 2008. He was the National Vice Chairman of the Council of Reserve Forces from 1999 to 2008 representing the Royal Marines. He served as the County Chairman for the St John Ambulance in Lancashire from 2003 to 2007. He was the County President of the Royal British Legion in Lancashire from 2005 to 2008. He was the founder of the Rossendale Enterprise Trust and the Rossendale Groundwork Trust. He is the President Elect of the Soldiers, Sailors, Airmen and Families Association-Forces Help for Greater Manchester. In November 2006, Sir David won a National Award for “Outstanding Leadership” sponsored by the Daily Telegraph. He was nominated as one of 100 of Britain’s most influential men and women in the Public and Private Sectors. He is married and has three sons. His wife, Lady Ruth Trippier is a practicing barrister on the Northern Circuit.